Yes, let’s go south of the river today on this walk through London. 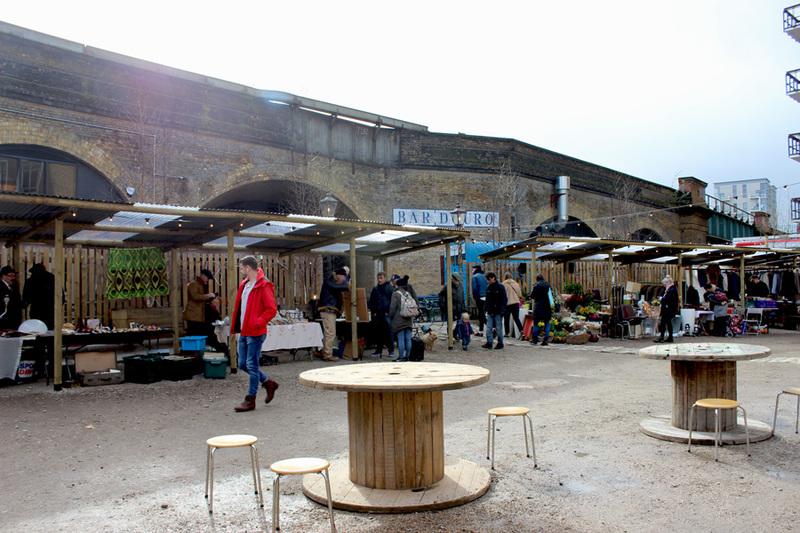 This route is best on a weekend day as the two markets that we’ll see are weekend-markets only. Foodies listen up! 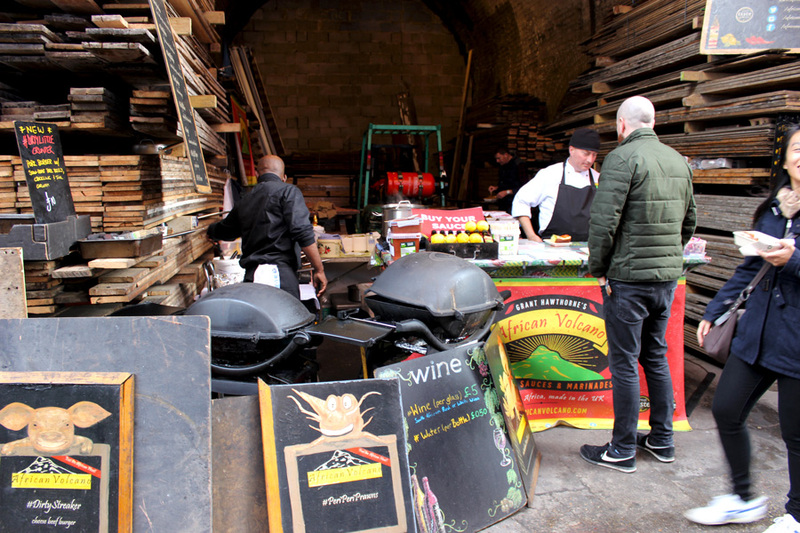 Because under the railway arches in Bermondsey is a food market that can’t be missed. 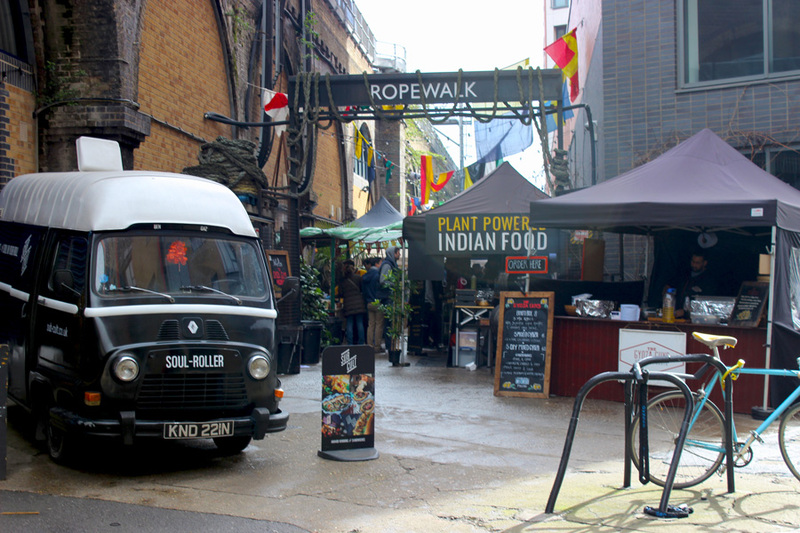 Ropewalk, that runs between Maltby Street and Millstream Road, is the perfect location for some quality-food-shopping. 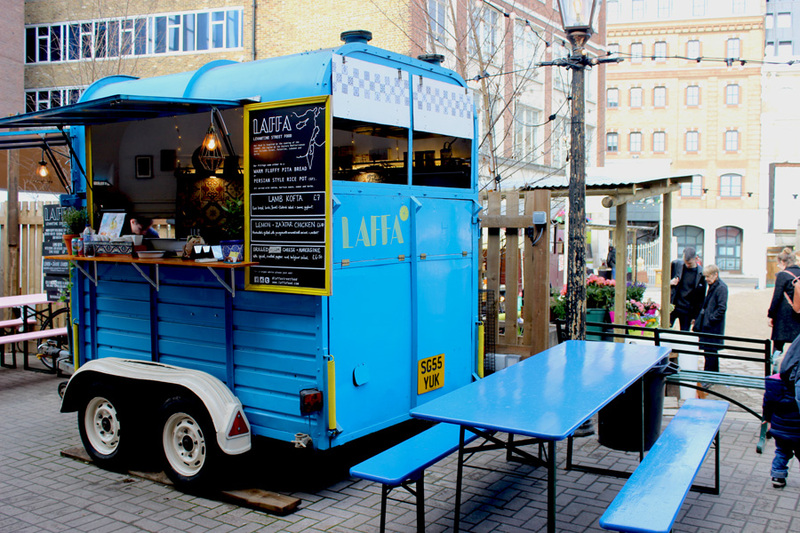 Come with an empty stomach, as it’s unlikely that you will leave this road without having tried any of the delicious bites that are on offer. It’s even possible to enjoy a sit-down meal as most of the railway arches offer a small restaurant or bar of some sort. 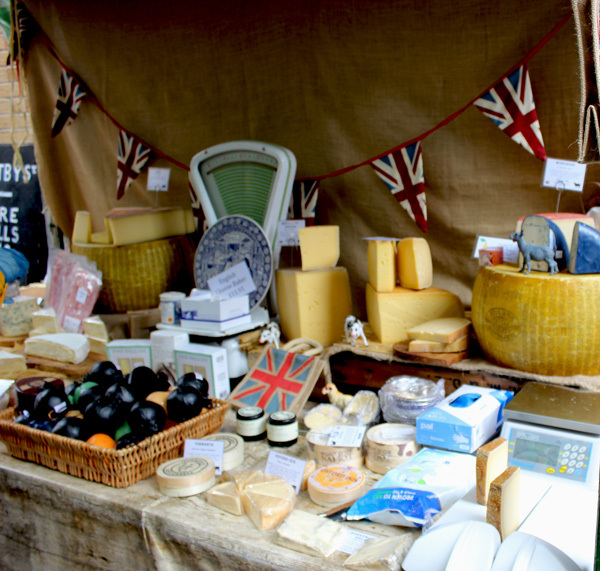 The food stalls sell everything from baked goods, to meat and cheese. And from peanut butter to oysters and craft beer. 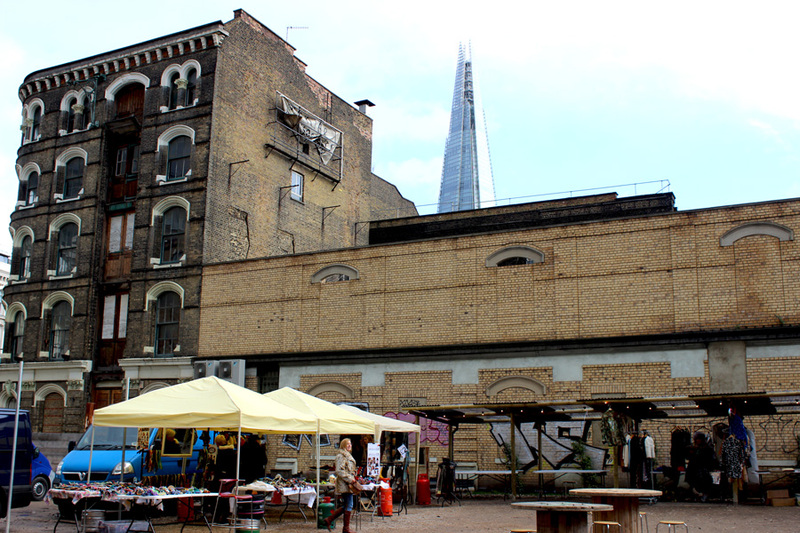 This food market is easy to get to from both Bermondsey Underground Station, as well as from London Bridge Station. For the next stop on our walk we stay close to Ropewalk. 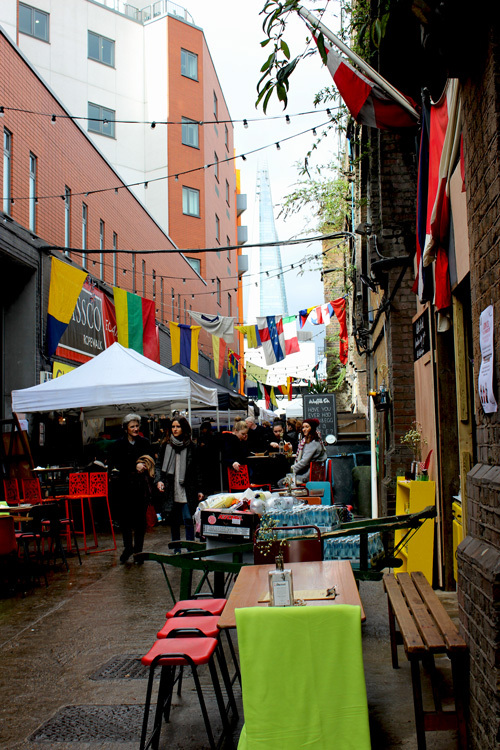 Bermondsey Street is a super charming street close to London Bridge Station. With a wide variety of coffee shops, bars and restaurants available, this area is a great place to visit during the day as well as during the evening. If you look carefully, you might even find some street art. Slowly but surely, we’re making our way towards Bankside. 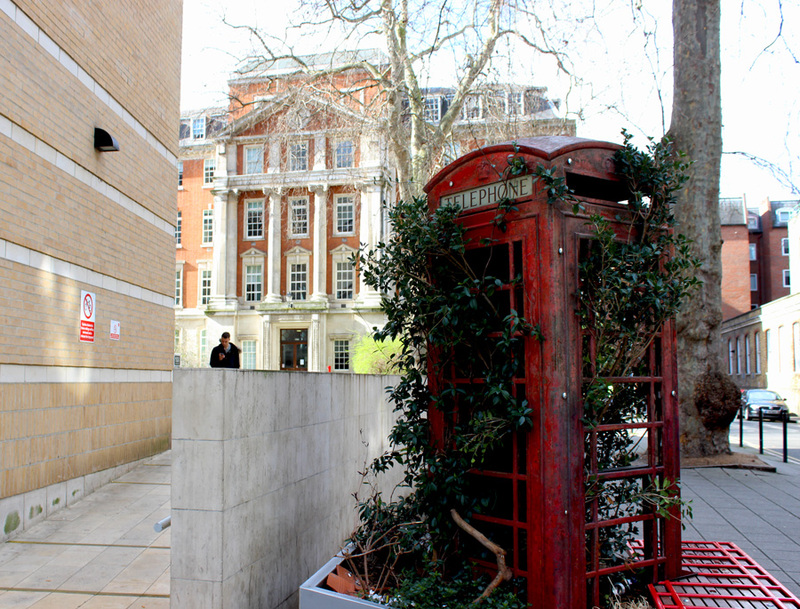 But not before we’ve a look at the artsy red phone box in front of Guy’s Campus of King’s College. From there it’s just a quick walk to King’s Head Yard. 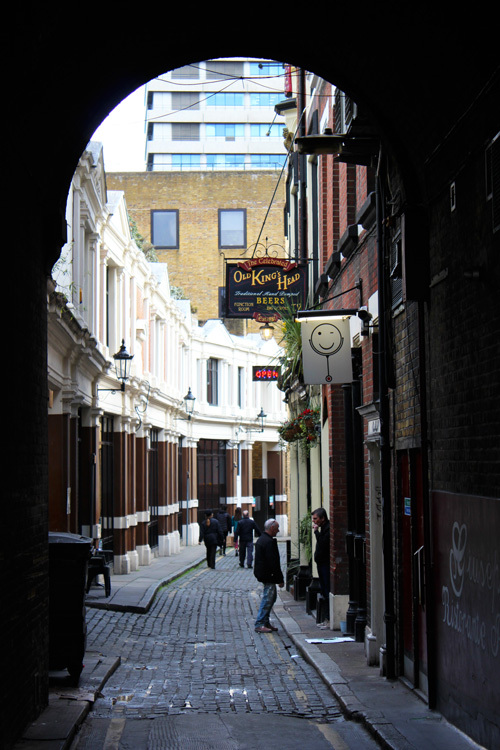 This alleyway is as quiet and as peaceful as can be. 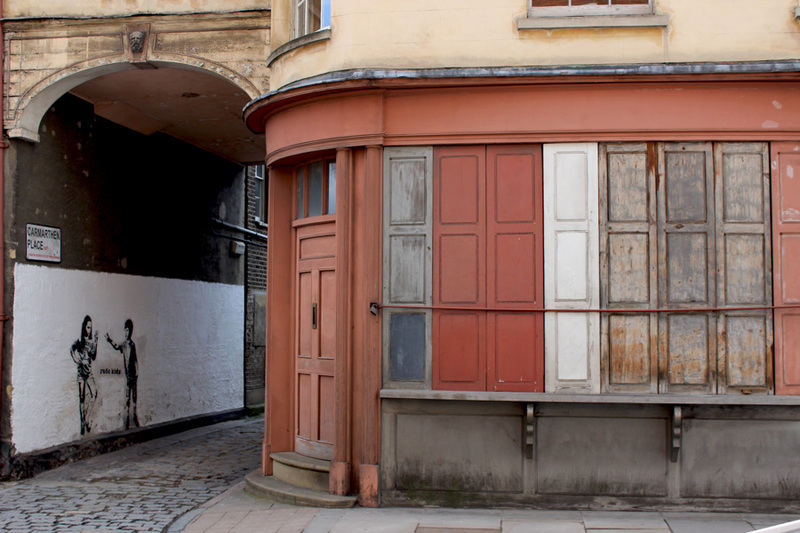 However, as soon as you exit it, the bustling traffic of Borough High Street catches you by surprise. 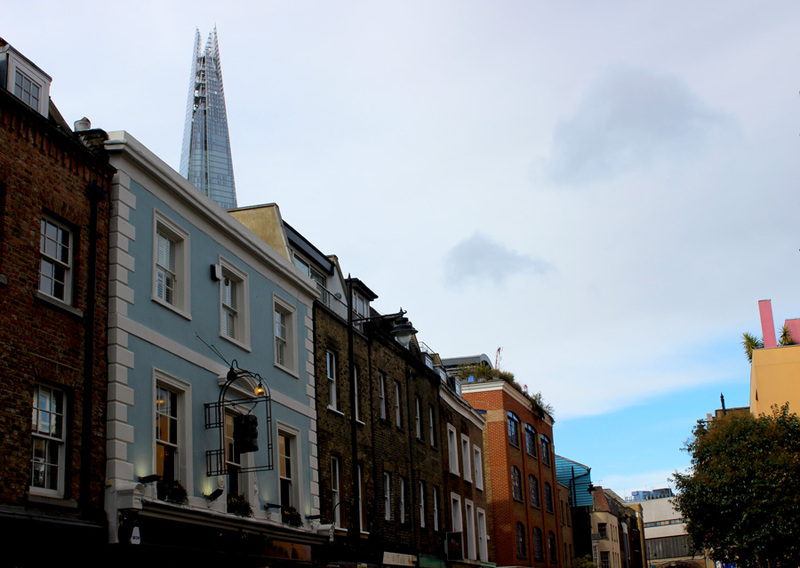 If you’re new to the Bankside area, I would certainly recommend you visit Borough Market from here, and walk along the river towards Southbank. Otherwise, follow in our footsteps and walk towards Crossbones Garden instead. It was last summer when I first heard about Crossbones Garden. One day in July, I was visiting the Clink Prison Museum with a friend. It was here where we read about prostitutes and outcasts being buried in this unconsecrated graveyard in medieval times. 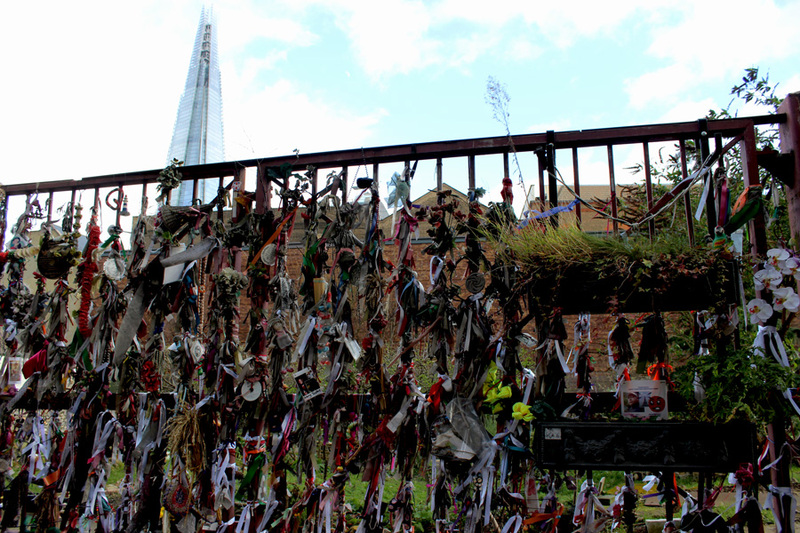 Only a stones throw away from The Shard, Shakespeare’s Globe Theatre and Borough Market, the graveyard is located in a an unnoticeable street in Bankside. Nowadays, it’s a garden of remembrance, which can be seen at all the ribbons attached to the garden’s gates. It’s a good place to reflect. 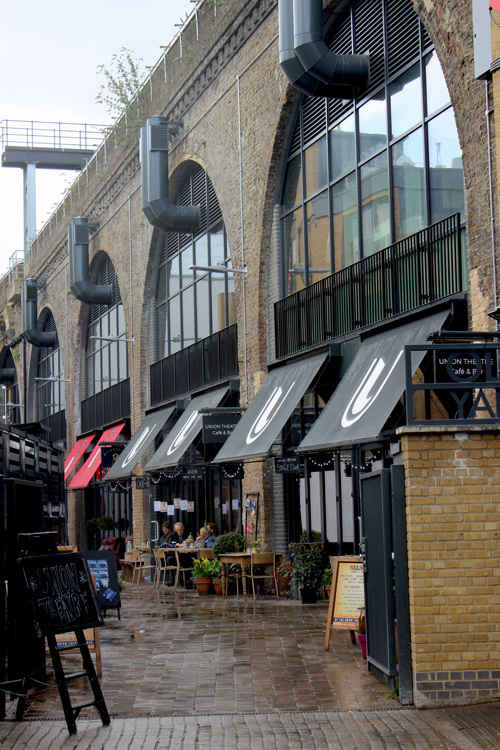 Bankside is doing really well on converting unused railway arches to retail and entertainment places. This definitely enhances the appeal of the area, which suffered from a dubious reputation for years. 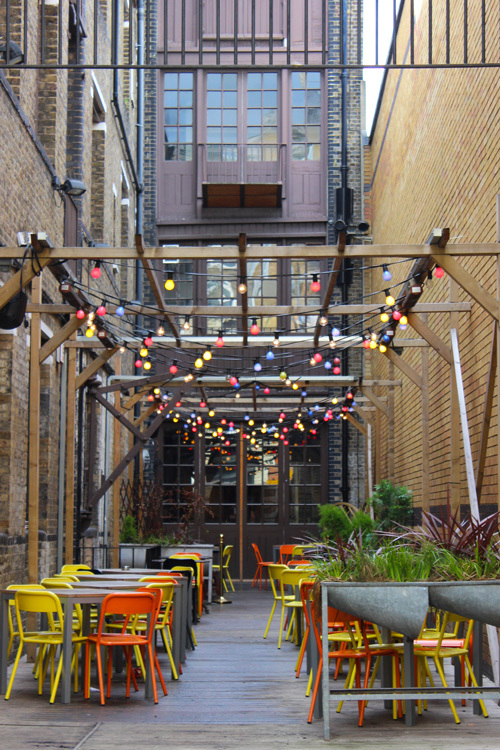 Flat Iron Square is just one of the examples of recent developments having taken place in the area to improve its allure. The square is connected by seven railway arches and Grade II listed building Devonshire House. It hosts a selection of food trucks, live music and entertainment, and a vintage market on Sunday. We’re now making a big leap from Bankside to the Waterloo Station area. More railway arches await… Or railway tunnels I must say! 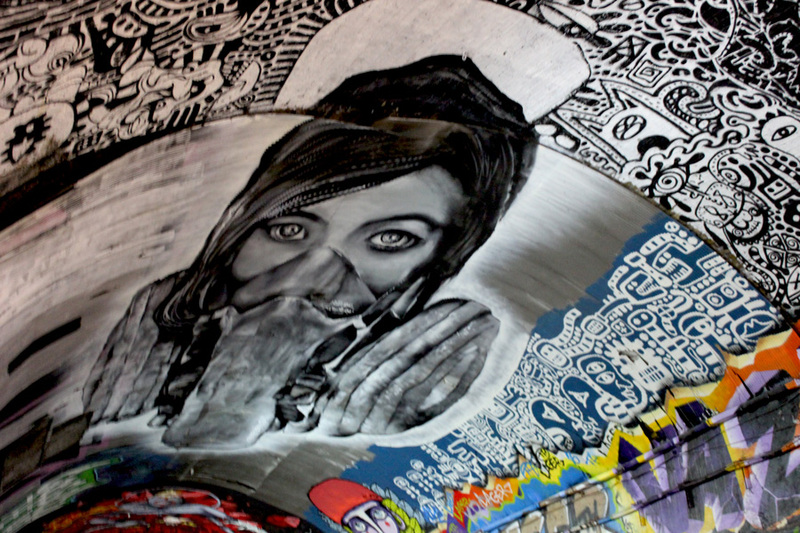 Because underneath Waterloo Station you can find the ‘Banksy’ Tunnel, also known as Leake Street Tunnel. 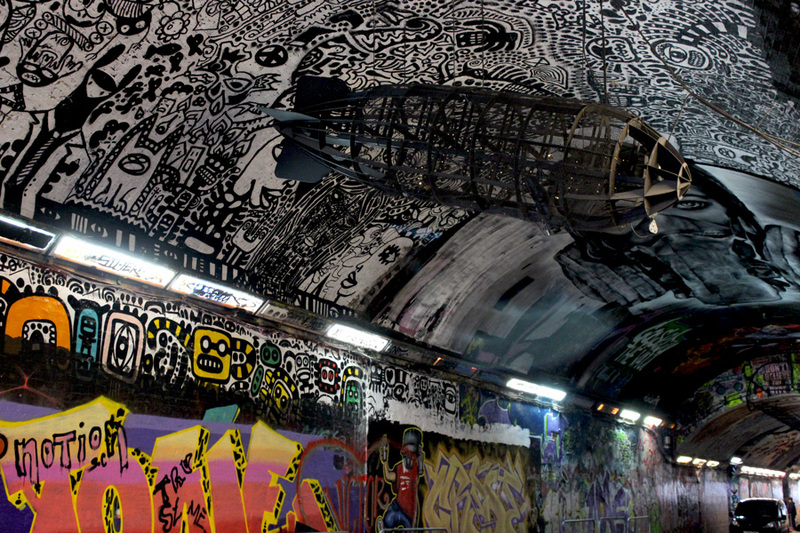 The street art tunnel was initiated by Banksy himself during the Cans Festival in 2008. 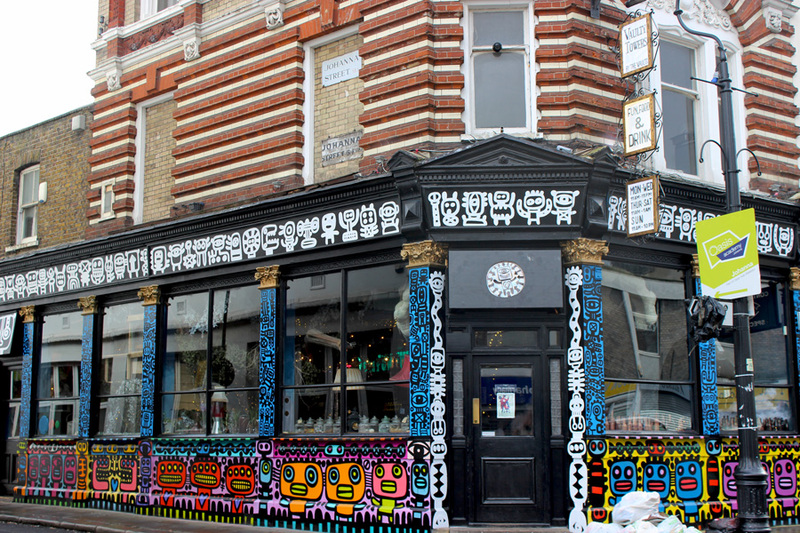 Today it still remains one of the only places in London where street artists can create their works without being fined or prosecuted. 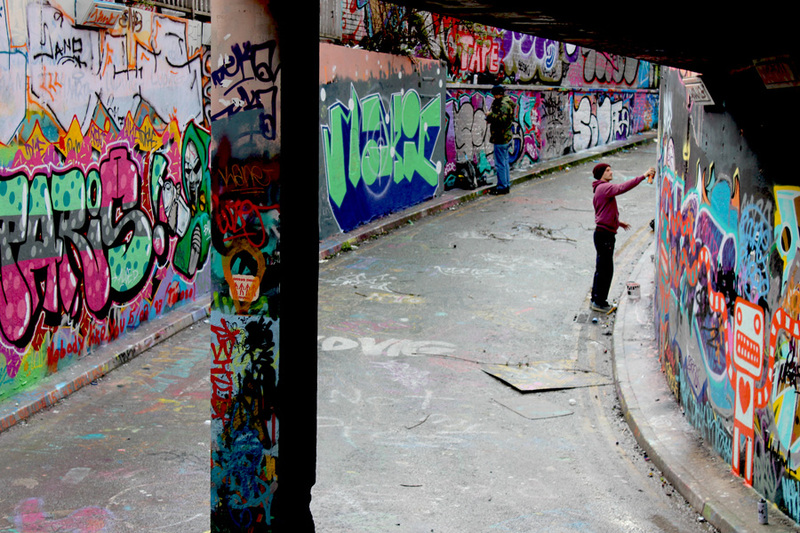 The tunnel changes all the time as new art is created on a daily basis. Artists are proud of their work and can tell about it freely as it’s being tolerated at this place. Another interesting hangout that can be found within this tunnel are The Vaults: an arts space where you an attend all sorts of events.